“Pacific Rim” was a special film for me, in more ways than one. 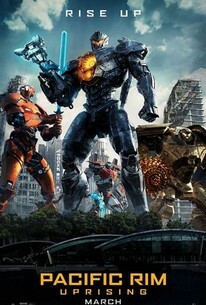 It was one of the first movies released in theaters that I ever reviewed, alongside the bland and boring “Man of Steel,” but also because “Pacific Rim” was such a breath of fresh air to the kaiju genre and one of the most fun and kickass movies of that year, certainly helped by the wonderful direction and dedication from Guillermo del Toro. It had a story world steeped in lore, development and intrigue while making it all seem natural, and felt like the greatest homage to the Godzilla films that we’ve ever gotten. 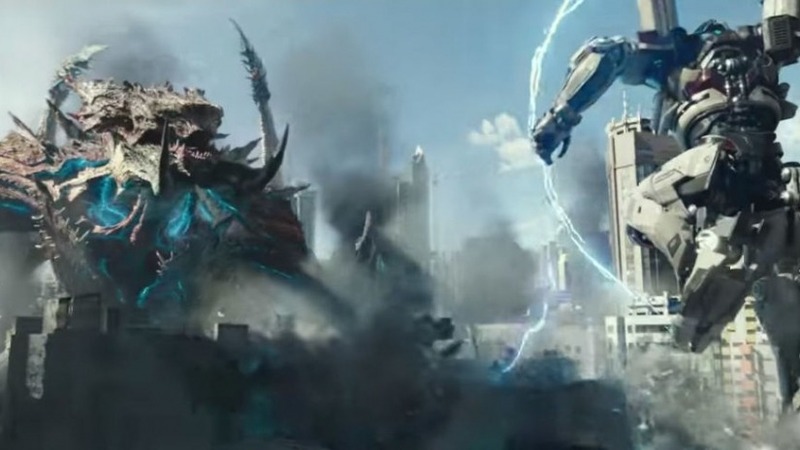 So imagine my disappointment and irritation when I found out that “Pacific Rim: Uprising” ditches all of that complexity and relations to the kaiju films of the past, and instead focuses on a story that has no direction or consistency and annoying teenagers that have little to no character. While the fight scenes are scarce and feel weak and insignificant to the story. This film makes last years’ “Power Rangers” look like a subtle masterpiece that understands teenagers struggles by comparison. 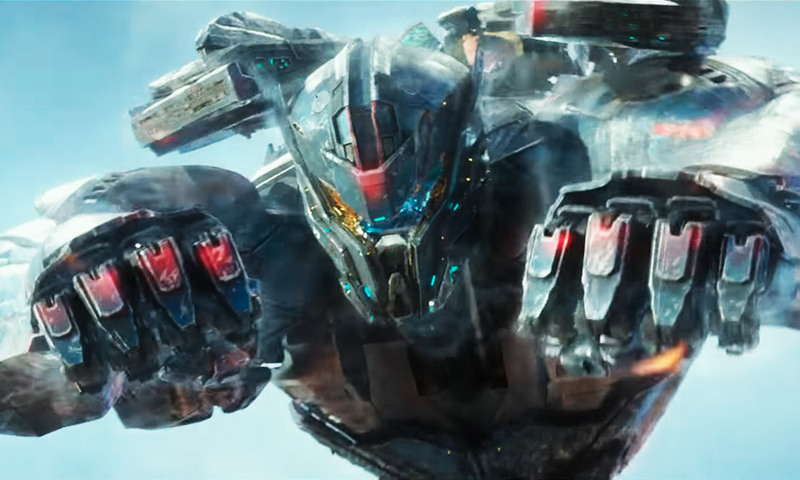 There is nothing eye-catching or satisfying about “Pacific Rim: Uprising,” only pain, annoyance, and more pain. It fails as not just a kaiju film, but as a Hollywood blockbuster. Set ten years after the events of the last film, Jake Pentecost (John Boyega), the son of the war hero Stacker Pentecost, the one that “cancelled the apocalypse,” lives in the ruins of Santa Monica trying to make a living selling spare Jaeger parts on the black market. He eventually gets captured by the world Jaeger military, along with a girl who built her own tiny Jaeger, and told to become an Jaeger-pilot instructor to the next generation of pilots or spend the rest of his life in prison. He chooses to reluctantly be an instructor, tutoring the girl from earlier and half a dozen other teenagers. One thing I don’t get about this is why the world still feels the need to use Jaegers. It’s been ten years since the last kaiju invasion, and there’s never been any sign that they’re coming back. Yet the world insists that Jaeger’s are needed to keep the it safe – from what? Some characters insist that the kaijus will return some day, but only because the script says that they’re coming back. We learned from the last film that Jaegers take a huge physical and mental toll on the pilots, plus can be just as destructive and dangerous as kaiju. So why does the world feel the need to keep them around when the fight has been over for a long time? Beyond that, the story is schizophrenic and lacks any sort of consistent tone. It feels like five different stories all vying to be taken seriously, including Jake’s journey to make a name for himself outside of being his father’s son, the corporate conspiracy to replace Jaegers with drones and the ramifications of that, the struggle between Jake and another instructor, and the training of these whiny annoying kids. All of them are haphazardly thrown together in a desperate attempt to stretch this out to two hours, when all you needed to do was give the audience what they wanted in the first place – giant robots beating up on giant monsters in stylized action sequences. But even when they do have monster fight scenes, those aren’t satisfying either. Often times, the camera is far too close or shaky to really appreciate the scope and size of the monsters. While other times, none of the hits or actions feel like they have an impact, like every kaiju or jaeger is throwing whimpy little punches. Even when they do hit something or crash into a building, it never feels like much damage was done, since the CGI is so fake and unrealistic that it feels like they’re being thrown through cardboard cities. Remember in “Pacific Rim” when a jaeger used a freight ship like a baseball bat and you got to see and feel just how hard the kaiju got hit? Or the reveal of Gypsy Danger’s sword arm in mid-air? There’s no moment like that in “Uprising” that makes you appreciate just how powerful these creatures are, just little dinky hits that take away from the jaeger’s invisible health bar, like a video game. The only redeemable aspect of “Pacific Rim: Uprising” is that Charlie Day is allowed to cut loose and be the crazy, rambling, full of himself guy that we’ve come to know and love from “It’s Always Sunny in Philadelphia” and “Horrible Bosses.” He’s in a surprising amount of the film, and he is the only one that feels like he’s in his element as he stumbles through a kaiju lab like a drunk teenager with nothing to lose. Even though this doesn’t really have a place being in a kaiju film, it is refreshing to see someone actually trying to be entertaining. But in the end, “Pacific Rim: Uprising” is a mess that doesn’t deserve anyone’s time or attention. It doesn’t understand what made the first film so beloved and does everything with little passion or energy, trying to go for more of a Marvel-esque feel instead of using the stunning the first film already created. The film has no sense of style or charm and just feels like a quick cash in…to a film that was out grossed by “Grown Ups 2” on its opening weekend. To put it simply, this film doesn’t make any sense.